For most of us, our days start in the morning at the office and don't end until dinner with clients or friends. Since most of us aren't blessed with an entire wardrobe at our cubes or the ability to go home and change multiple times per day, we rely on one outfit that'll work all day long: the 24-hour outfit. While a standard ensemble of a black dress and black pumps can certainly pass, that's hardly inspiring. To give you a sense of creative ensembles that'll work 24 hours a day, we rounded up simple (but fashionable!) 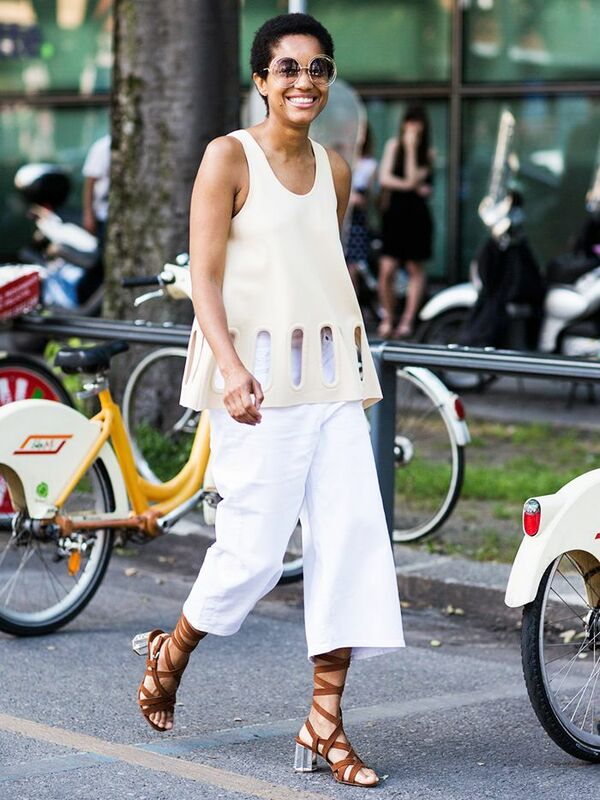 street-style looks below that you can easily copy. Keep scrolling for inspiration and make getting dressed a whole lot easier during the week. A printed dress is statement-making enough on its own, so there's no need for excess add-ons. While a bold print may seem too much for some office settings, if you choose a dress with a classic silhouette, it'll totally fly—and the print will be perfect for your after-hours drinks. If you're not a blazer kind of girl, try a chic gilet instead—it'll keep your 9-to-5 look sophisticated with a blouse and trousers—but isn't too stuffy for a night out, either. A skirt above the knee (perfect for a night out!) can work in most offices if you cover up on top with a chunky sweater. The perfect versatile outfit. A sleeveless top is ideal for happy hour with your friends—and when paired with wide-leg trousers and heels, it works well for your important meeting, too. If you are a blazer kind of girl, try pairing yours with a tee (or a button-down, if that's better for your office), skinny pants, and killer heels. While the overall vibe may seem buttoned-up for the evening, the funky shoe keeps the look cool. Will you try a 24-hour outfit? Let us know your thoughts in the comments below!